Although there has been extensive examination of educational leadership in the developed world (e.g. Fullan, 2001; Leithwood & Sun, 2012), there has been much less research on school leadership in fragile states such as Haiti. This paper responds to Dimmock and Walker’s (2000) call for greater attention to comparative and international research on educational leadership specifically by examining school leadership in the Haitian context. 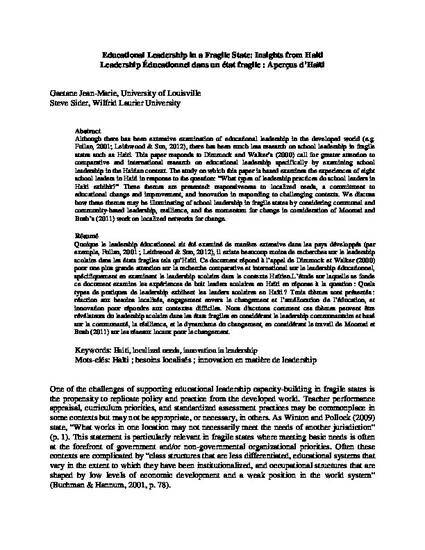 The study on which this paper is based examines the experiences of eight school leaders in Haiti in response to the question: What types of leadership practices do school leaders in Haiti exhibit? Three themes are presented: responsiveness to localized needs, a commitment to educational change and improvement, and innovation in responding to challenging contexts. We discuss how these themes may be illuminating of school leadership in fragile states by considering communal and community-based leadership, resilience, and the momentum for change in consideration of Moorosi and Bush’s (2011) work on localized networks for change. Gaetane Jean-Marie and Steve Sider. "Educational Leadership in a Fragile State: Comparative Insights from Haiti"